I was an Airbnb host for one year, letting out a spare bedroom with ensuite in Central London. During the first 6 months I hosted 43 guests from more than 8 different countries with the average review being an okay 3 stars. However one too many bad experiences, I decided to hang up my Airbnb keys and retire. I grew tired of the stress of hosting as horrible Airbnb guests taught me to dislike people. Sounds straight forward? Well preparing the room takes usually one hour and trust me that is the easy part. The copious amount of laundry that comes with it is also a piece of cake. The hard part is dealing with people. On my advert I clearly stated that I cannot facilitate check-in before 6pm on a weekday due to work. However the majority of guests auto booked and then tried to push me to accommodate an early check-in. Plenty of times I used annual leave or worked from home to do this and I was more than happy to do it. Unfortunately, 98% of the time guests were late and didn’t keep to their promised check-in time! When you work a full time job, later is usually better. However people who arrived significantly later than the agreed check-in time without bothering to let me know could ruin my night. If they would only let me know! Sometimes I would like to go out but I was stuck waiting at home for the guest to arrive. Other times, they arrived so late beyond my bedtime the next day I was like a tired zombie at work. Most guests don’t realise that I am not a hotel service and that I rely on their good word when indicating what time they will check-in. But I can live with all that and in all honesty I was late home 3 times. 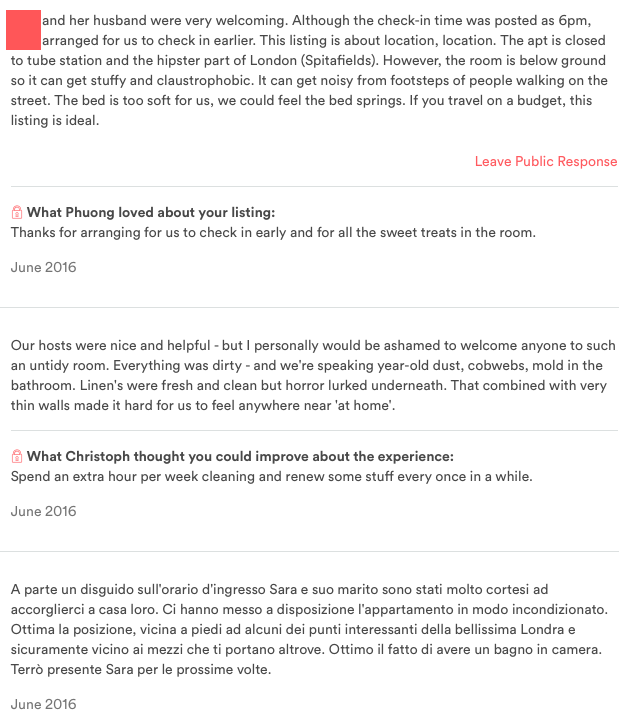 What really made me lose faith in humanity was the constant complaining of horrible Airbnb guests. By the time I decided to end the Airbnb arrangement, I had become so depressed and demotivated by all the bad reviews I couldn’t bring myself to read them anymore. The room was not great, I admit it. But the location was fantastic and the price I was charging was a fraction of what it actually would cost to live here as a resident. I tried to be helpful and offer advice on local sights and restaurants, but the harder I tried the more people seemed unhappy. Complaints varied. The ones that particularly upset me were about the quilt being stained. Yes the quilt was stained. I took it to the dry cleaner but they could not remove the stain. So I put the quilt in a clean quilt cover but unfortunately this was not good enough for some people. Other people complained the walls were paper thin but that was out of my control. Someone even complained they were not given a glass to drink water from… but they never asked for one! However there were a few kind and memorable guests that I was grateful for. I hosted lovely couples from Switzerland, Spain, Poland and Chile who were all humble and pleasant. One of my first German guests even bought me chocolates! I also had a couple of cool Aussies. But the best were the guests from China, who were never too shy to ask for what they needed, made themselves at home and they never EVER complained! 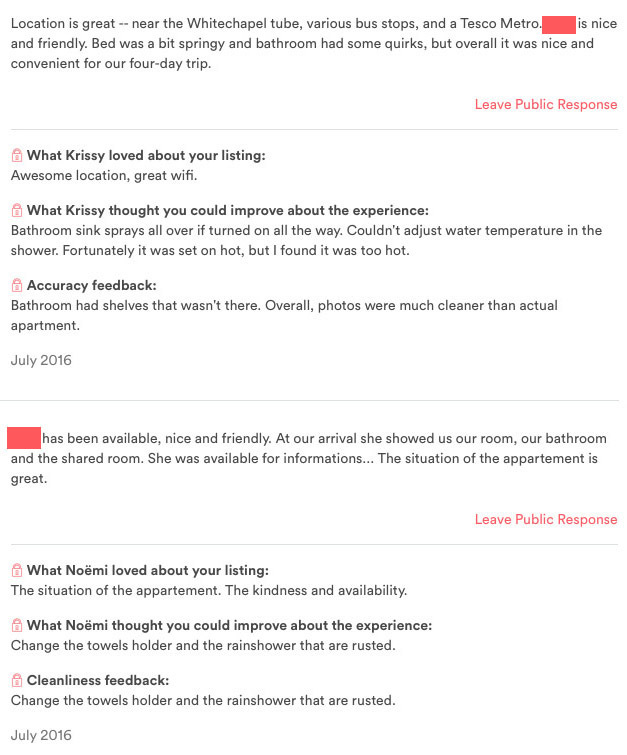 Being a host on Airbnb I found to be a depressing experience. When I first started the adventure I would invite guests to join me and my friends for a beer, exchange contact details and plan to visit them in their home country one day. By the end of the experience I had become demoralised and scared of being too friendly in case I offended any sensibilities. There were just too many horrible Airbnb guests. Is Airbnb a great idea? Sure it is! It is cheaper than a hotel and for longer term stays, you can have all the comforts of home. However I always thought the key was about meeting new people and having new experiences. It turns out, this is the worst part of all! 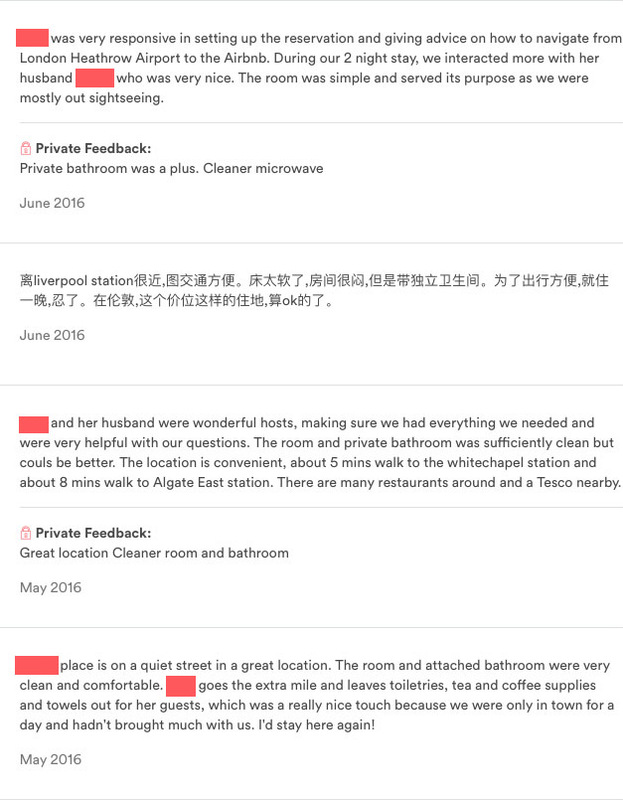 Please read below some of the reviews and decide whether these are horrible Airbnb guests or am I being too sensitive?